An urgent issue for White is to build a second eye for a big dragon at the top. At the same time White can counter-attack in the center. White remembers that there is a ko at the top as the last resort for a second eye. There are gaps between White's stones at the bottom and on the right side. 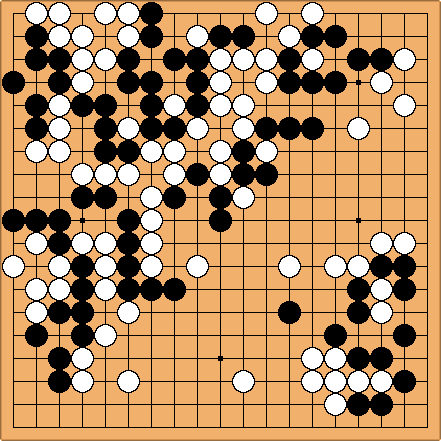 White still hopes to be able to use the dead group on the left side. White 1 puts three black stones into atari to try to cut off a black group in the center. Black 2 saves the three stones. Black cannot ignore the threat because in this case the white big dragon would live and White will have an easier game. White 3 jumps away to avoid a geta and attacks a black group in the center. Black tries to escape with 4. White 5 separates the black groups. Black tries to connect to the main forces with 6 and White plays solidly at 7, trying to catch a group to the left. If White succeeds in catching it there is a possiblity of an approach ko. Black escapes with 8, attacking at the same time a white group. Now White tries to cut off Black's center group with 9 and Black answers at 10, creating a threat against the bottom. The fight is very complex and both opponents certainly make a lot of mistakes (at every move). In conditions of a strict time control it is impossible to read out all possible variations.